It's cold out. What better time to invest in a new fleece? Or pop it on the Christmas list. Over the last few weeks we've been trying out a selection of jackets in a range of fabrics designed to cope across a range of conditions. North Cape Lhotse. My first outing in this jacket was to a football match at a bitterly cold Recreation Park in Alloa in November. It responded extremely well to standing around on the terraces for 90 minutes and kept me snug and warm. Since then it has been out into the Scottish hills and is very cosy in winter conditions and extremely comfortable. The cut is good and it has a high collar, good arm length and elasticated cuffs. Combined with a wind and waterproof overlayer when conditions dictate, it's an ideal purchase for walking in Scotland throughout the year and packs down well for summer use when it may spend most of its time in your rucksack. There are two zipped hand pockets and a zipped chest pocket. The Lhotse is made from Polartec Aircore 200 fabric for maximum warmth with less weight and succeeds admirably on both counts. It costs £65 and scores an extra point for being made in Scotland. For more on this jacket and the North Cape range for walking, mountaineering and mountainbiking, visit their website at www.north-cape.com. The North Face Jammer Jacket. We like the look and design of this jacket which is made from Polartec Windbloc fabric. It's a warm top, water and wind resistant and fairly light. Features include a wind flap running the full lenth of the zip, two front zipped pockets, an adjustable hem and a high cut collar to keep the wind off your face. Expensive, but a good choice for winter if you're not counting the pennies. £125.00. 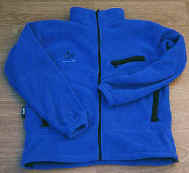 Mountain Equipment Aquafleece Standard/Mountain Jackets. I've always been a fan of Mountain Equipment tops and this one is no exception. The Aquafleece is waterproof and windproof and is fine for walking in showers, but not heavy rain. There are two hand pockets, lycra cuffs and a full length zip with internal flap. The standard jacket costs £110. If you're considering some more extreme winter mountaineering, its worth considering splashing out another £35 for the Aquafleece Mountain Jacket which is a good deal more robust. Wynnster Fastnet. Price-wise, this is the cheapest of our line-up at just £50. The Aquastop fabric is not as effective or light as Windstopper and Windbloc but it's a good value compromise for low level winter walking. The cut is good and the quality of the garment is well up to standard with good quality zips and an elasticated waistband. There are two hand pockets and a fairly extensive choice of colours. A good budget buy. www.wynnster.co.uk.